When Paris fell in June 1940, Britain stood alone against Germany. Air attack became the only means to harm the enemy. At first, only German military targets were hit, but with each bomb, the definition grew a little broader: telephone exchanges, railway stations, industrial targets. If workers' homes were hit, it was a necessary evil. In September, Hitler gave his reply. 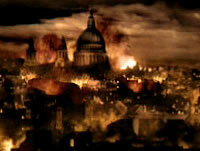 If they attack our cities, he said, we will raze theirs to the ground – and the Blitz on Britain began. For the first time in 1,000 years, Britain's status as an island nation could not protect it. This was an invasion from the air and civilians were the target. By Christmas 1940, people feared that something even worse was coming. It finally arrived on the night of 29/30 December. This website gives an hour-by-hour account of what happened that terrible night, when German bombers launched their most devastating attack yet on London. This is accompanied by the words of some of those involved in the carnage, computer reconstructions and links to relevant websites and books.